After many years housing school children, and many more as a shirt factory, this great old building on Main Avenue in Loveland, Ohio, is now home to artists. Potters, Glass Bedmakers, Stained Glass and Mosaic Artists, Painters, Photographers, Fiber Artists, and more! Purchased by Shawn and Chandra Custis in 2005, the building was originally slated to be an antique mall. But when they were approached by a local glass artist with a big idea for art studios, they were sold on the idea of creating a sort of art colony: a place where art would be created and where the public could visit the studios, browse the gallery, and learn about art. A bedroom community of Cincinnati, Loveland is situated just 30 minutes north of the metro area and has a thriving arts community. 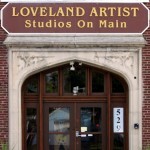 In addition to our own art studio residents, Loveland is home to several other creative outlets throughout the city, such as For the Love of Art studio for kids and teens and the newly opened Whistle Stop Clay Works, a ceramics teaching studio that hosts “Cocktails & Clay” on Friday nights. Click here to view the City of Loveland’s current art opportunities and events. Shawn and Chandra have invested hundreds of hours rehabbing the building, creating an ideal space for creative work. Painters like the second-floor studios with their 13-foot ceilings, big windows, and abundant light, while glass artists appreciate the concrete floors. Natural light abounds all over the building, and many studios feature beautiful, old hardwood floors. Periodically, we hold special events that are open to the public. In the past, we’ve held gallery openings, children’s art shows, special fundraisers, art open houses, and more. DAt some of these events, our resident artists will open their studios to talk about their art and make their finished work available for sale. Check our Events page or Facebook for up-to-date information.